Developers received approval for 123 new condominium units in Queens during April and May and can begin marketing units for sale, according to data from the New York State Attorney General’s office. The number of approved units is down significantly from the 343 new units approved during April and May of 2016, although a vast majority of those came solely from one 280-unit project: Grand Three at Sky View Parc, part of the large Sky View Parc complex in Flushing. In April and May of this year, units were spread across seven new developments in Elmhurst, Astoria, Far Rockaway, Rego Park and Long Island City. Two projects each were approved for Astoria and Long Island City, while one each was approved in the other three neighborhoods. The largest approved project was the Elm 51 Condominium at 87-22 51st Avenue in Elmhurst, with 44 units. The smallest was a two-unit condo project at 10-18 47th Avenue in Long Island City. Other approved projects include the Slate Condominium, a 28-unit project at 28-18 Astoria Boulevard, the Rego Garden Condominium, a 23-unit project at 64-86 Wetherole Street, and the Lincoln Condominium, a 16-unit project at 23-33 31st Road in Long Island City. No condo projects were filed in Flushing during April and May, despite the neighborhood’s significant condo boom. However, developers filed plans for 122 units in the neighborhood at the beginning of the year, and Flushing, Astoria and Long Island City saw the bulk of condo plans filed in 2016 as well. 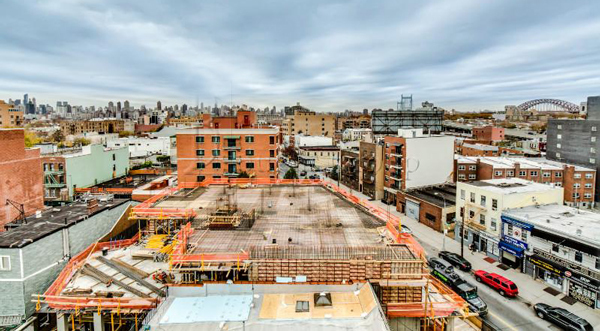 The total project sellout in Queens for approved projects in April and May is $93 million. Between April and May of last year, the total projected sellout on approved condos was $335 million, though about $280 million of that sum came from the Sky View Parc project.